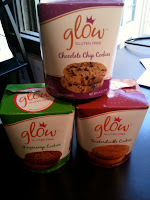 The Food Allergy Queen: Glow #gf cookies review: FANTASTIC! Glow #gf cookies review: FANTASTIC! out the Kitchenaid every time I need a munchie), but that they taste like "regular" cookies....I don't feel like I'm missing a thing! The snickerdoodle is just the right balance of cookie, sugar and cinnamon. Perfect with a cup of tea or coffee. The chocolate chip tasted to me like a Chips Ahoy. It's the first time I was excited that something tasted like a commercial cookie. Chocolate chocolate chip was rich. Super chocolatey for a cookie. Would be great with ice cream or your favorite ice cream substitute. Gingersnap wasn't as gingery as I had hoped. It was sorta like a snickerdoodle wannabe! Still good though. Note: Glow cookies are NOT egg-free, and they're made in a facility that processes nuts. Also, the chocolate versions have soy lecithin. I have not seen them in stores here in LA, so I needed to order them online at glutenfree.com. As are most specialty foods, they are not as cheap as commercial products, they are $5.60 per package of 7. Personally, I would not offer these at large parties, but save them for myself for special occasions. Have you tried them? Let me know what you think! PS. I think the packaging is both ingenious and adorable.